Microsoft MSFT shares have surged roughly 16% in 2019 to outpace the S&P 500 and help the historic tech giant’s stock hit multiple new 52-week and all-time highs. 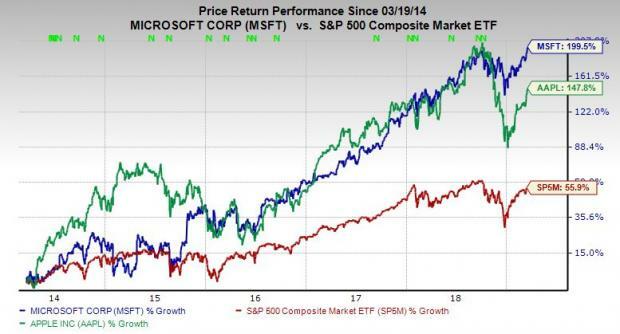 Now, the question is should investors consider buying Microsoft stock as the company expands its cloud computing and IoT businesses, while maintaining its influence over the personal computer market? Microsoft is clearly still a leader in the PC, laptop, and software space. The company’s video game unit has also grown over the years, driven by Xbox, which competes directly against Nintendo NTDOY and Sony SNE. MSFT hopes that its Netflix NFLX-style Game Pass will help expand its reach and market share in the ever-growing video game market. On top of that, Microsoft is already a cloud giant that boasts the second-largest market share in the industry, behind only Amazon AMZN and ahead of IBM IBM and Google GOOGL. The company has a laundry list of major Fortune 500 clients, which includes the likes of Walmart WMT and other giants. Meanwhile, Microsoft’s ownership of LinkedIn could become even more important as Facebook FB and Twitter TWTR face more backlash and government scrutiny. Last quarter, LinkedIn revenue soared 29% on the back of record engagement levels. It is also worth pointing out that Microsoft recently unveiled its next-generation augmented-reality headsets known as HoloLens 2, which combine AI and mixed reality and are promoted as a way to bring companies into the future. Microsoft has tried to position itself as a leader in an industry that some analysts expect to explode over the next 10 years. Fellow tech giants, including Apple AAPL, Google, Facebook, and many others are all racing to roll out augmented reality technology that enables users to see images and holographic elements intertwined with the real world. As we mentioned at the top, shares of MSFT have started off the year strong and closed regular trading hours Monday at yet another new all-time high of $117.57 per share. Despite the climb, MSFT stock is currently trading at 24.3X forward 12-month Zacks Consensus EPS estimates. This marks a discount compared to its industry’s 26X average. Microsoft is also trading below its one-year high of 26.9X and almost exactly in line with its 12-month median of 24.4X. We can clearly see that the company’s valuation picture is a bit stretched by its own historical standards. But we know that the broader Computer Software-Services Market has tracked Microsoft’s climb over this period, with MSFT always trading at a discount. Moving on, our current Zacks Consensus Estimate calls for Microsoft’s Q3 fiscal 2019 revenue to pop over 11% to reach $29.83 billion, which would fall just slightly below Q2’s 12% top-line growth. More specifically, Microsoft’s quarterly Intelligent Cloud revenue is projected to jump approximately 17.5% from $7.896 billion to reach $9.282 billion, based on our NFM estimate. This would mark a slowdown from last quarter’s 20% expansion. MSFT’s current full-year revenues are projected to surge roughly 12.2% from $110.36 billion in fiscal 2018 to reach $123.87 billion. The firm’s full-year fiscal 2018 revenue popped 14%. Peeking even further down the road, Microsoft’s fiscal 2020 revenue is expected to pop 9.8% above our current year estimate to reach $136.03 billion. At the bottom end of the income statement, the firm’s adjusted Q3 earnings are projected to climb 5.3% to hit $1.00 a share. MSFT’s current full-year earnings are projected to jump 13.7%, with 2020’s EPS figure expected to climb 11.8% above our 2019 estimate. Investors will note that the company’s earnings estimate revision activity has been mixed recently, with a larger portion of new estimates trending in the wrong direction. Microsoft is currently a Zacks Ranks #3 (Hold) based somewhat on the earnings estimate revision activity we just touched on. The company is also a dividend payer that has paid out a $0.46 per share dividend throughout fiscal 2019. This marked a 9.5% increase from the prior year’s quarterly payout and an 18% jump from fiscal 2017. Let’s also not forget that fellow tech titan Apple looks headed for a downturn, while Amazon’s revenues finally seem poised to slow down.